2 What is INTERNET? - it is a computer network made up of thousands of networks worldwide. There are organizations which develop technical aspects of this network and set standards for creating applications on it, but no governing body is in control. The Internet backbone, through which Internet traffic flows, is owned by private companies. 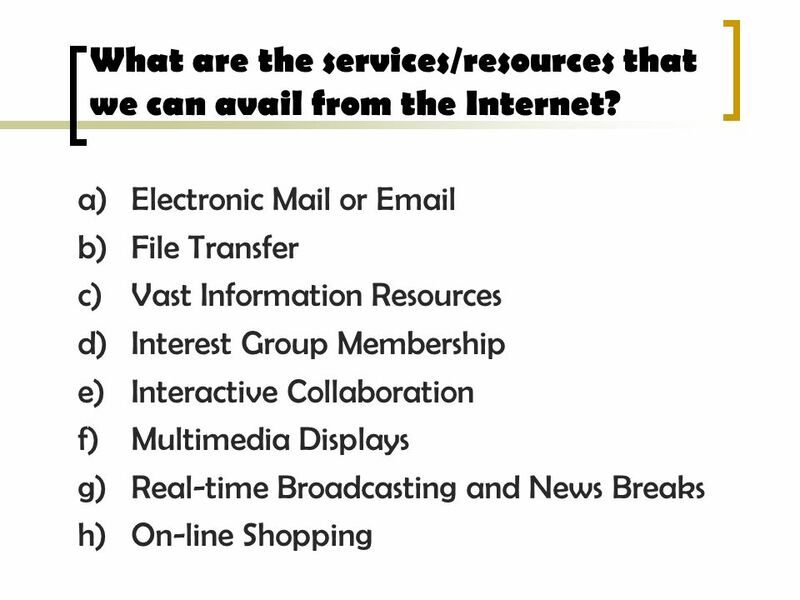 3 What are the services/resources that we can avail from the Internet? 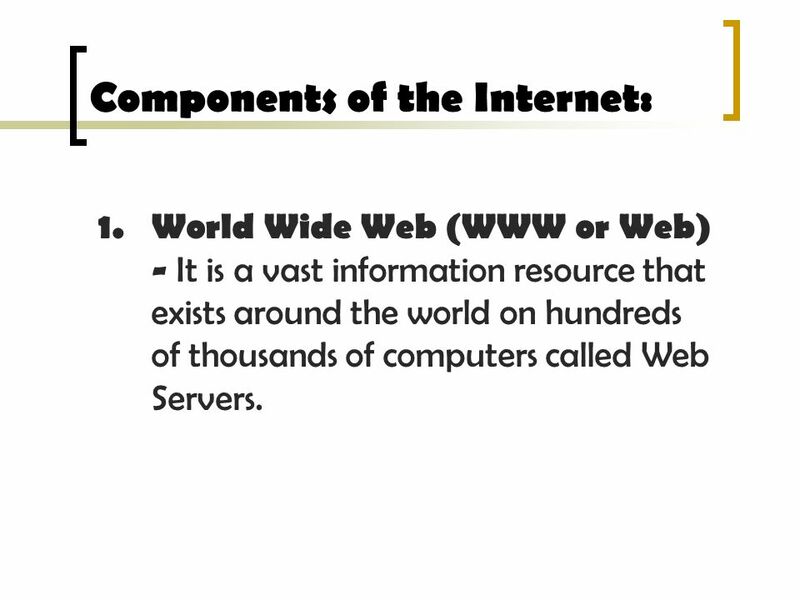 World Wide Web (WWW or Web) - It is a vast information resource that exists around the world on hundreds of thousands of computers called Web Servers. 7 Electronic Mail or - Allows computer users locally and worldwide to exchange messages. Each user of has a mailbox address to which messages are sent. 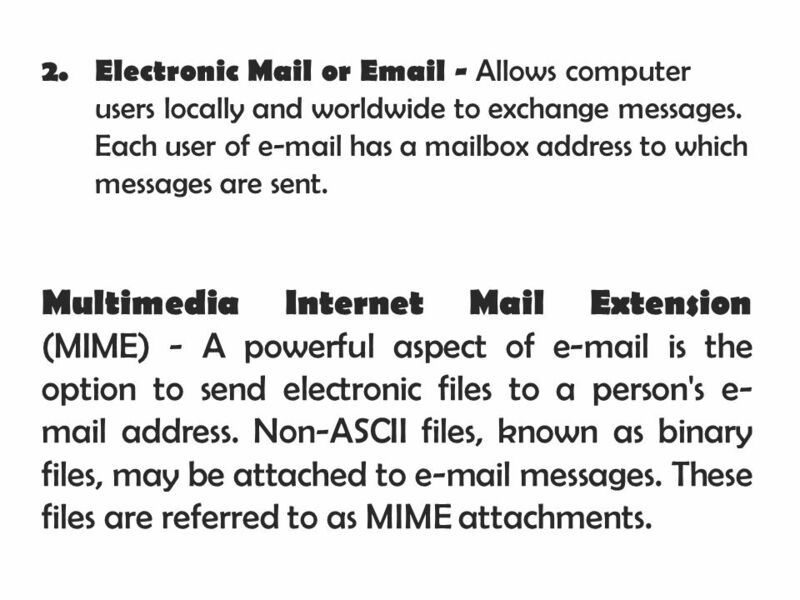 Multimedia Internet Mail Extension (MIME) - A powerful aspect of is the option to send electronic files to a person's address. Non-ASCII files, known as binary files, may be attached to messages. These files are referred to as MIME attachments. A common plug-in utilized on the Web is the Adobe Acrobat Reader. 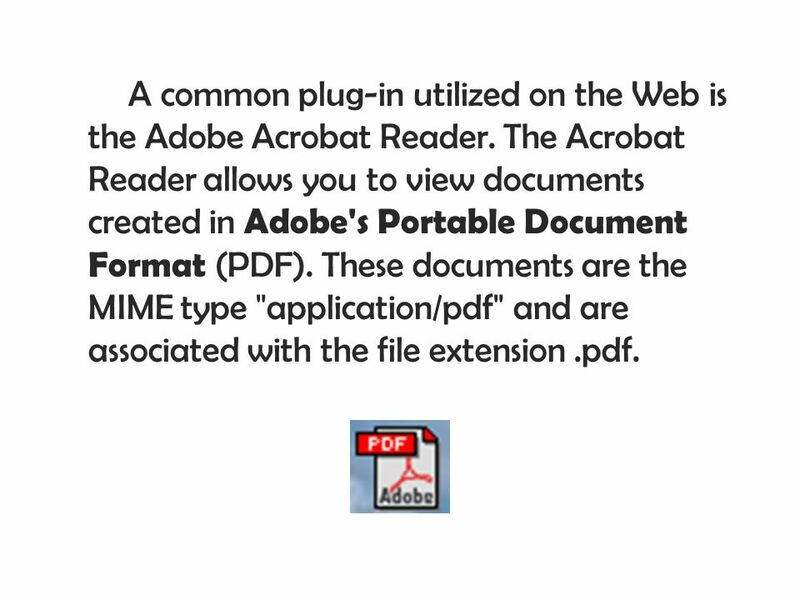 The Acrobat Reader allows you to view documents created in Adobe's Portable Document Format (PDF). 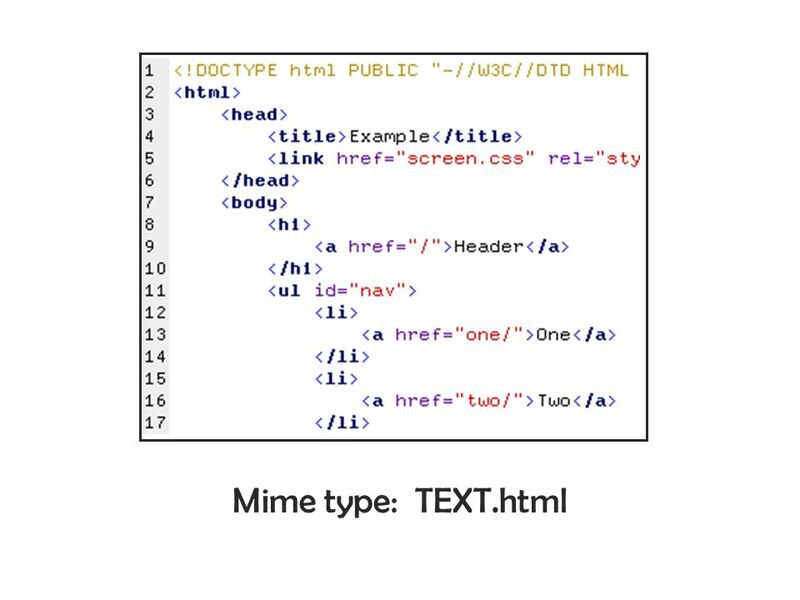 These documents are the MIME type "application/pdf" and are associated with the file extension .pdf. 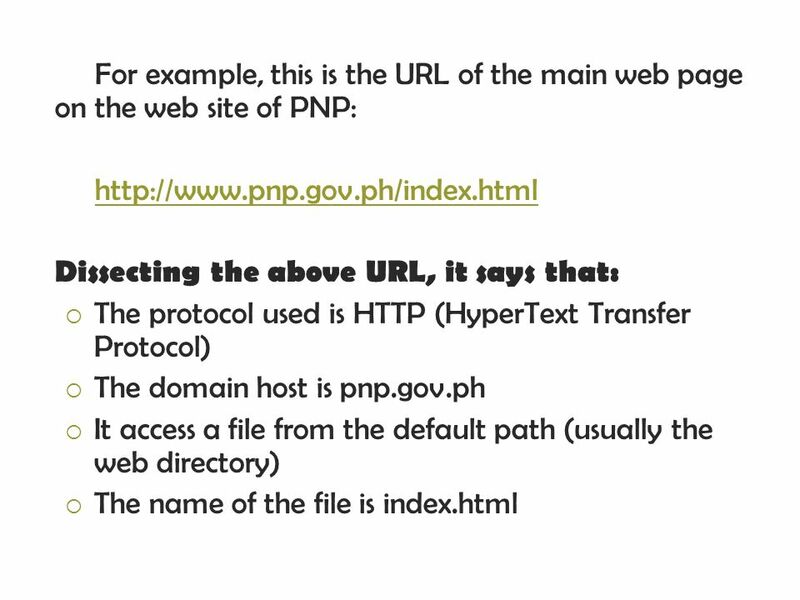 10 File Transfer Protocol (FTP) - This is both a program and the method used to transfer files between computers. 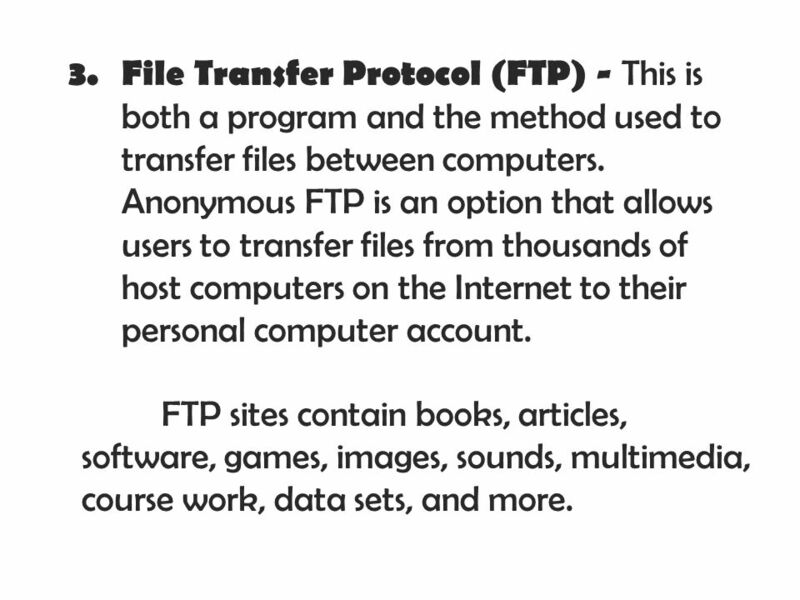 Anonymous FTP is an option that allows users to transfer files from thousands of host computers on the Internet to their personal computer account. FTP sites contain books, articles, software, games, images, sounds, multimedia, course work, data sets, and more. 11 Chat and Instant Messaging - Chat programs allow users on the Internet to communicate with each other by typing the information into the interface, in real time. 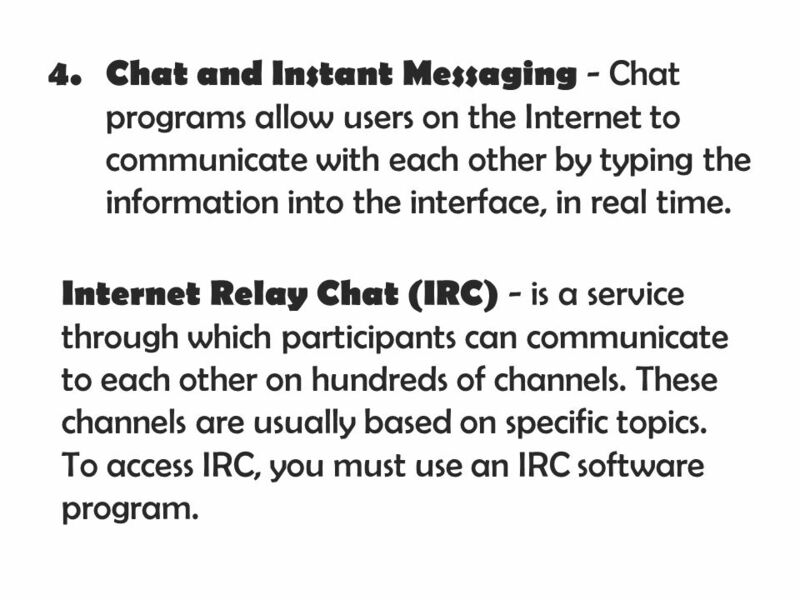 Internet Relay Chat (IRC) - is a service through which participants can communicate to each other on hundreds of channels. These channels are usually based on specific topics. To access IRC, you must use an IRC software program. 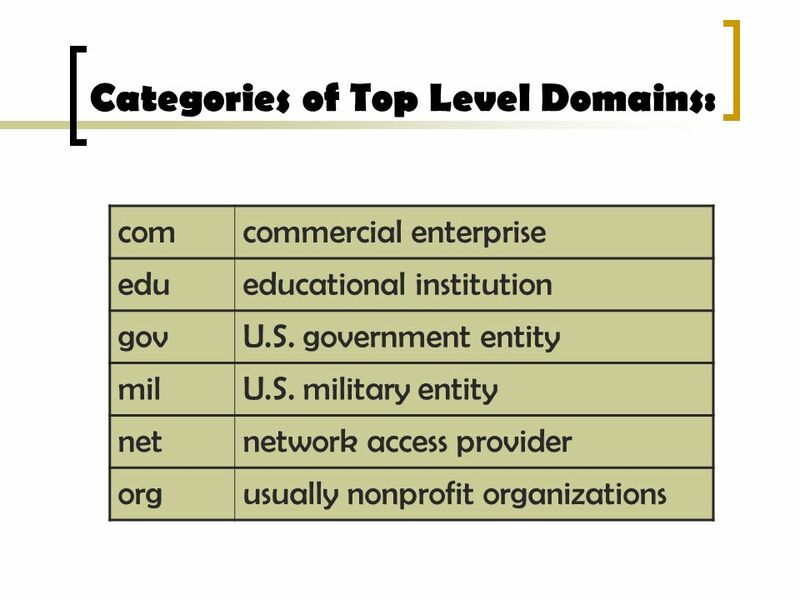 12 Telnet Sites - is a program that allows you to log into computers on the Internet and use online databases, library catalogs, chat services, and more. There are no graphics in Telnet sessions, just text. 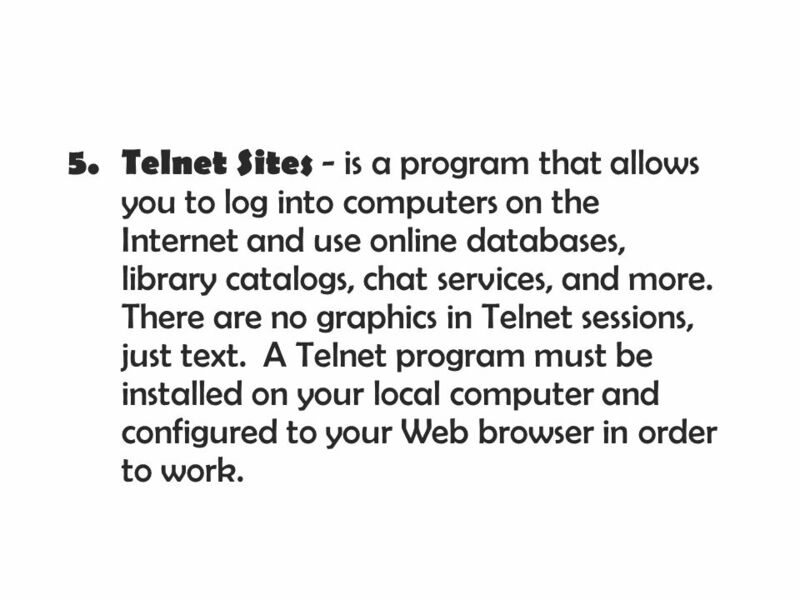 A Telnet program must be installed on your local computer and configured to your Web browser in order to work. 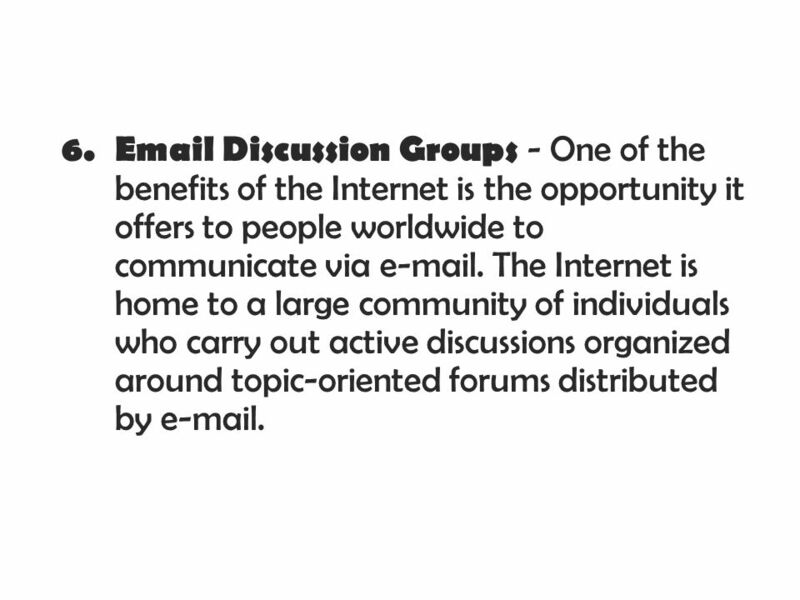 13 Discussion Groups - One of the benefits of the Internet is the opportunity it offers to people worldwide to communicate via . The Internet is home to a large community of individuals who carry out active discussions organized around topic-oriented forums distributed by . 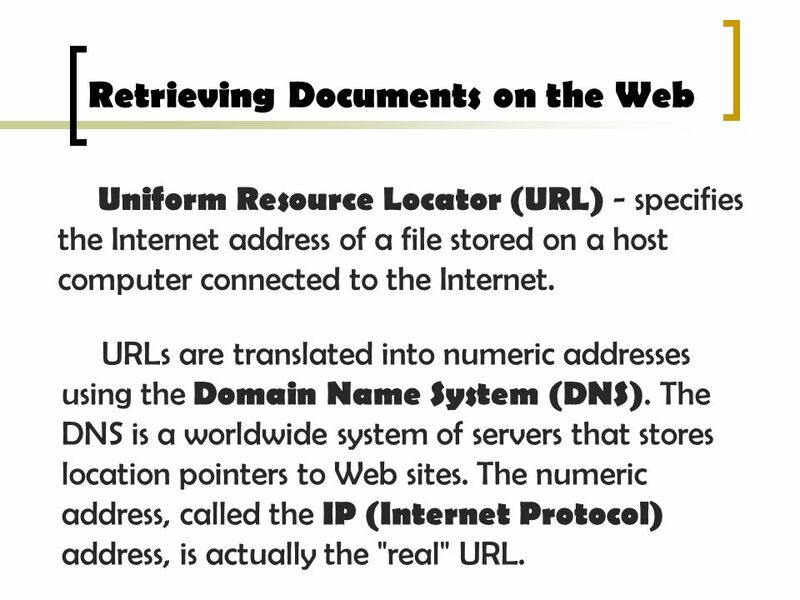 Uniform Resource Locator (URL) - specifies the Internet address of a file stored on a host computer connected to the Internet. 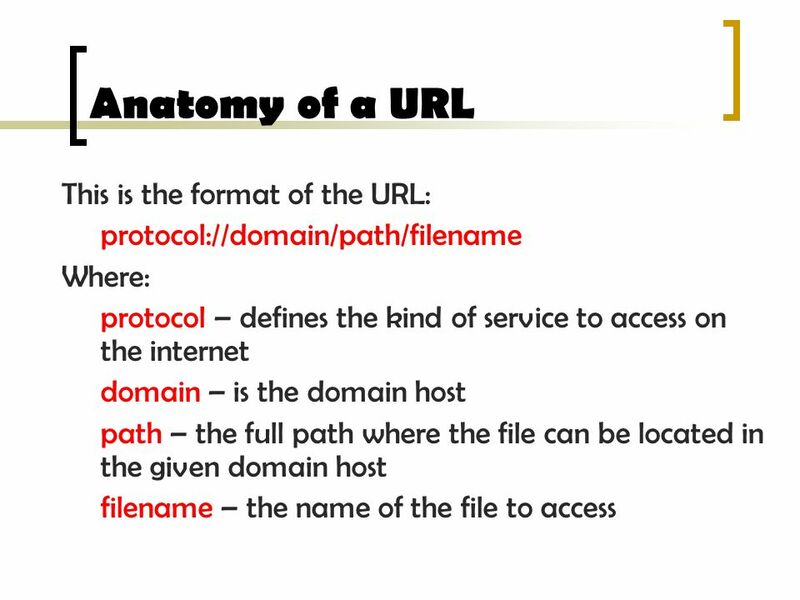 URLs are translated into numeric addresses using the Domain Name System (DNS). The DNS is a worldwide system of servers that stores location pointers to Web sites. 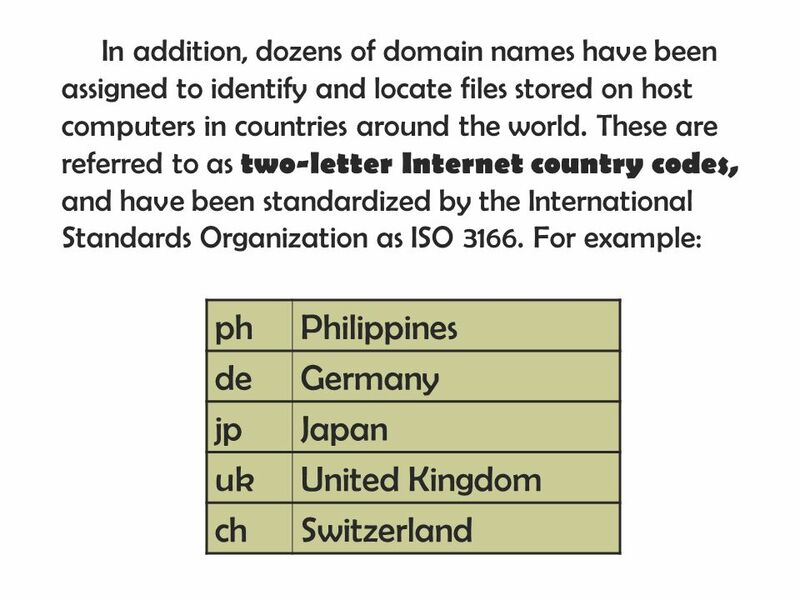 The numeric address, called the IP (Internet Protocol) address, is actually the "real" URL. Title Bar - shows the title of the current Web page. It also tells you whether you are connected to the Internet or are working offline. Menu Bar – this shows the main menus that give you access to all Explorer’s features which are File, Edit, View, Favorites, Tools and Help. Standard Toolbar: Contains icons for a variety of features: Back, Forward, Stop, Refresh, Home, Search, Favorites, History, Mail, Print and Discuss. 21 Back - Each time you click on this arrow, you will return to the next previous site that you visited. This will bring up a list of pages you have visited. 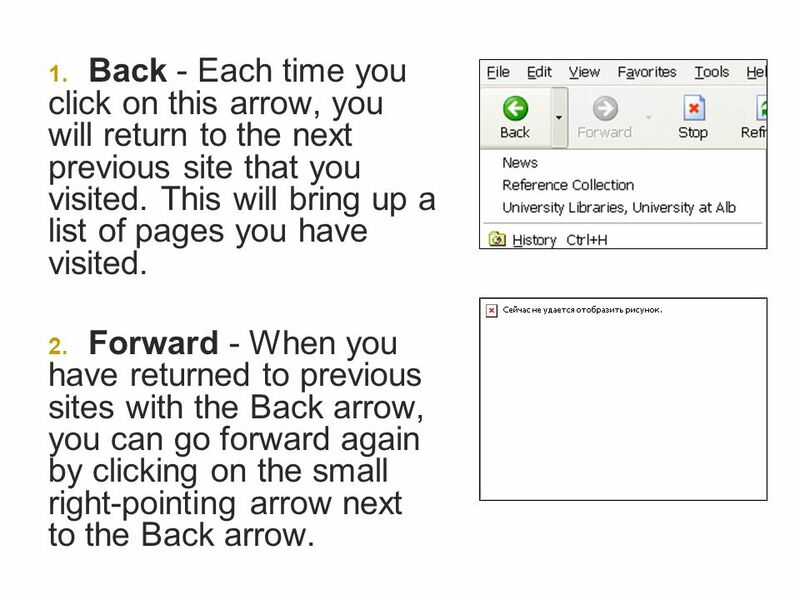 Forward - When you have returned to previous sites with the Back arrow, you can go forward again by clicking on the small right-pointing arrow next to the Back arrow. 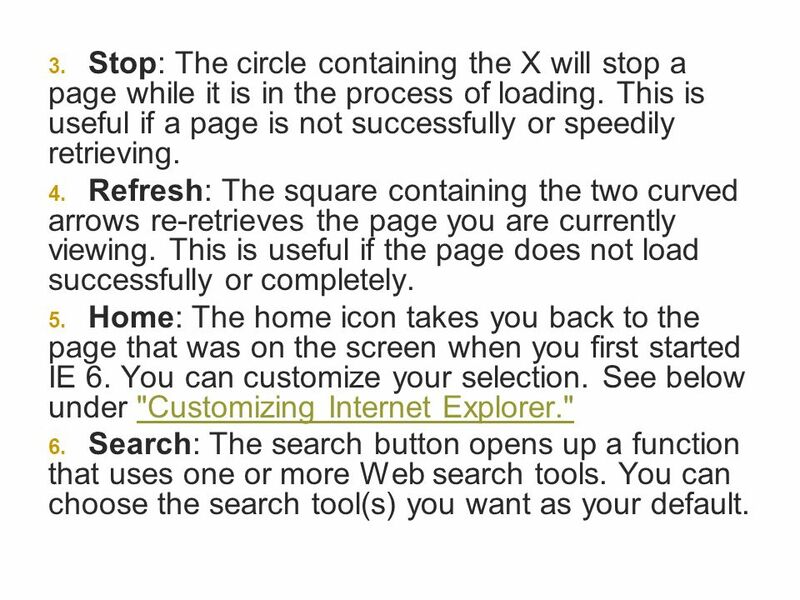 22 Stop: The circle containing the X will stop a page while it is in the process of loading. This is useful if a page is not successfully or speedily retrieving. Refresh: The square containing the two curved arrows re-retrieves the page you are currently viewing. This is useful if the page does not load successfully or completely. Home: The home icon takes you back to the page that was on the screen when you first started IE 6. You can customize your selection. See below under "Customizing Internet Explorer." Search: The search button opens up a function that uses one or more Web search tools. You can choose the search tool(s) you want as your default. 23 Favorites: Favorites are Web sites you have visited that you would like to store for easy access. You can add, delete and organize your Favorites. To add the current Web page as a favorite, click on Favorites and then Add. To delete a Favorite, simply right click on the item and choose Delete. 24 History: The history function allows you to view and select Web pages you have recently visited. You can sort your items by clicking on the black triangle to the right of the word View. You can sort by size, date, the number of times visited, and the order you have visited today. Mail: You can read from this window. Choose the software you wish to use by going back to the Menu Bar and choosing Tools/Internet Options/Programs. Print: Allows you to print the current page. This option will be explained in more detail below under Printing. Edit: You may edit the current page in the HTML editor of your choice. Choose the editor by going back to the Menu Bar and choosing Tools/Internet Options/Programs. 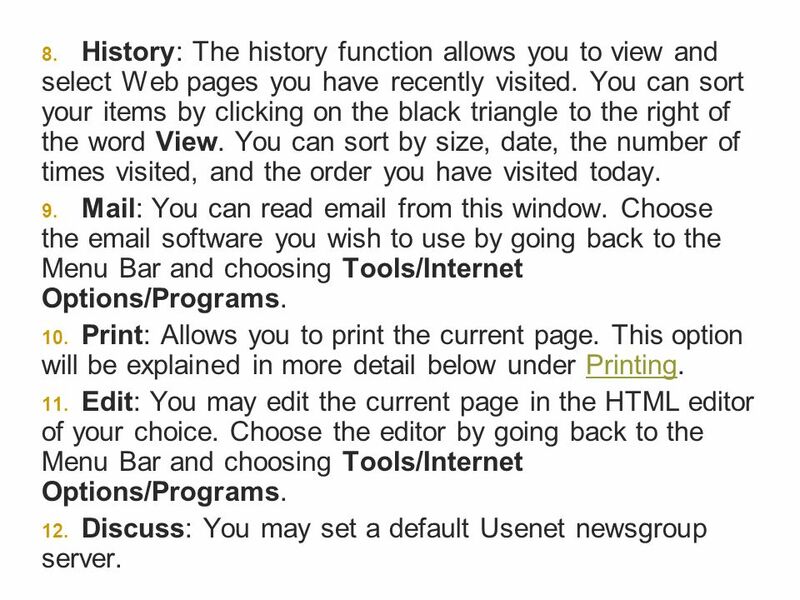 Discuss: You may set a default Usenet newsgroup server. Type the URL in the Address bar at the top of the screen. 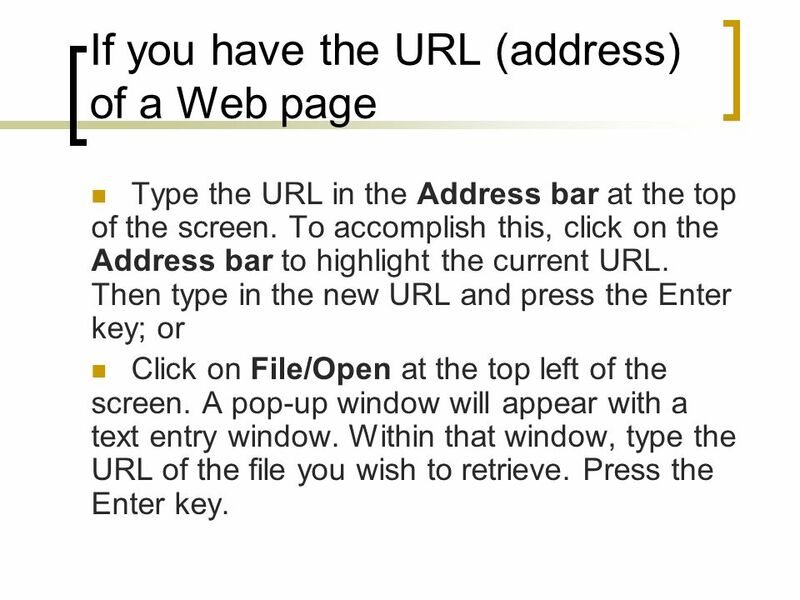 To accomplish this, click on the Address bar to highlight the current URL. Then type in the new URL and press the Enter key; or Click on File/Open at the top left of the screen. 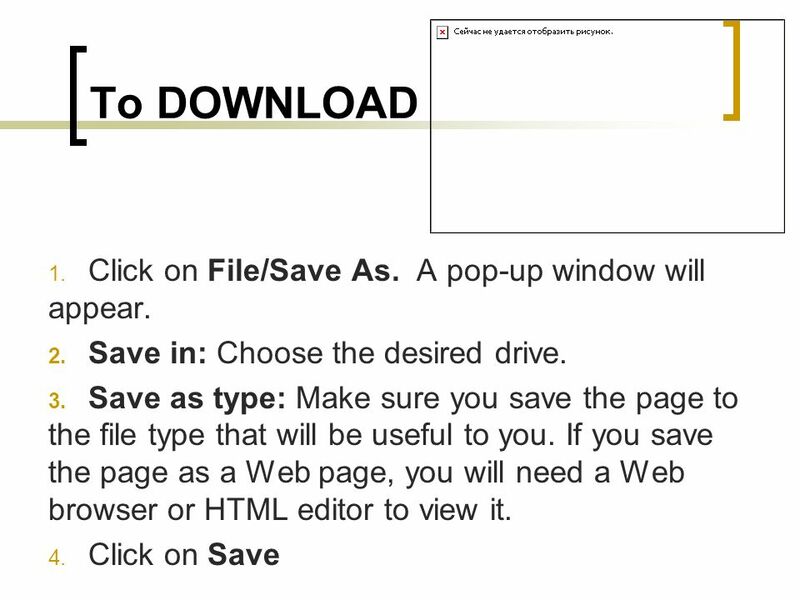 A pop-up window will appear with a text entry window. Within that window, type the URL of the file you wish to retrieve. Press the Enter key. 28 To DOWNLOAD Click on File/Save As. A pop-up window will appear. 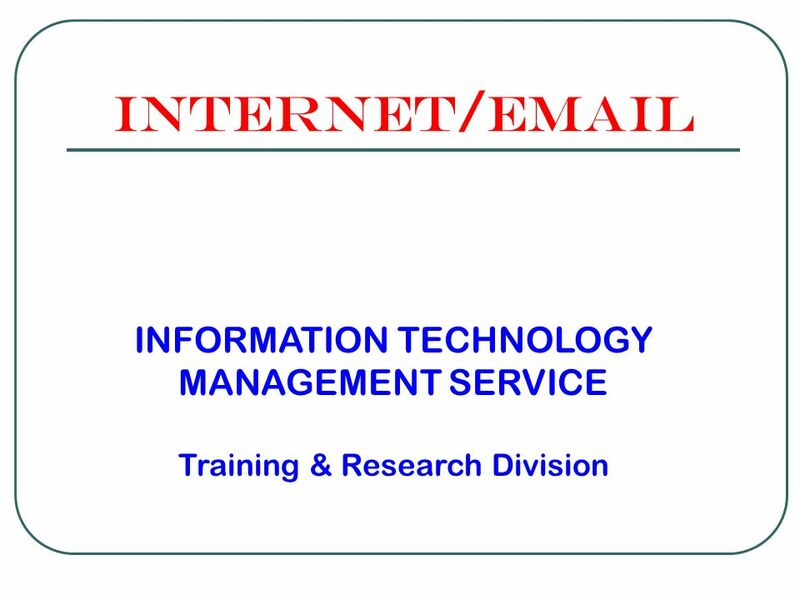 Download ppt "Internet/ INFORMATION TECHNOLOGY MANAGEMENT SERVICE"
Internet Basics Instructors : Connie Hutchison & Christopher McCoy. 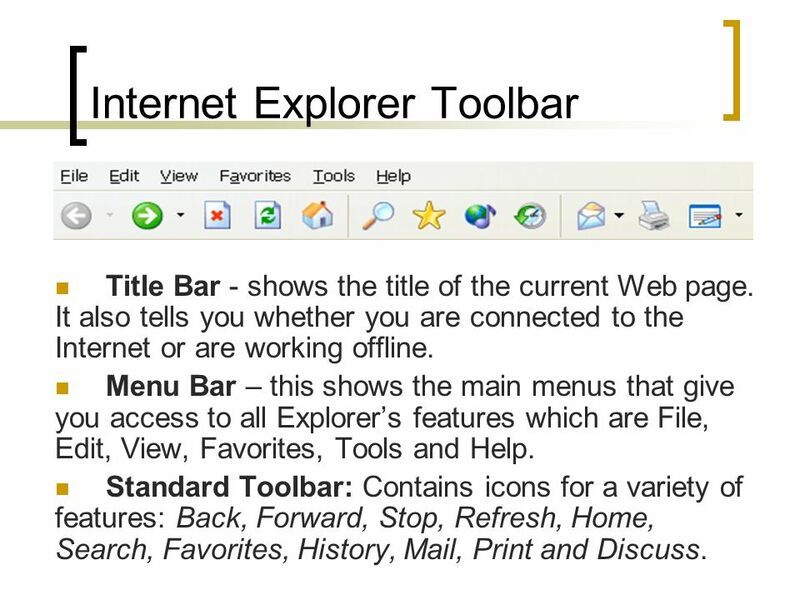 the Internet browser of choiceVidor ISD What is Internet Explorer? a Web browser* produced by the Microsoft Corporation *a software application used. Internet Basics The World Wide Web. 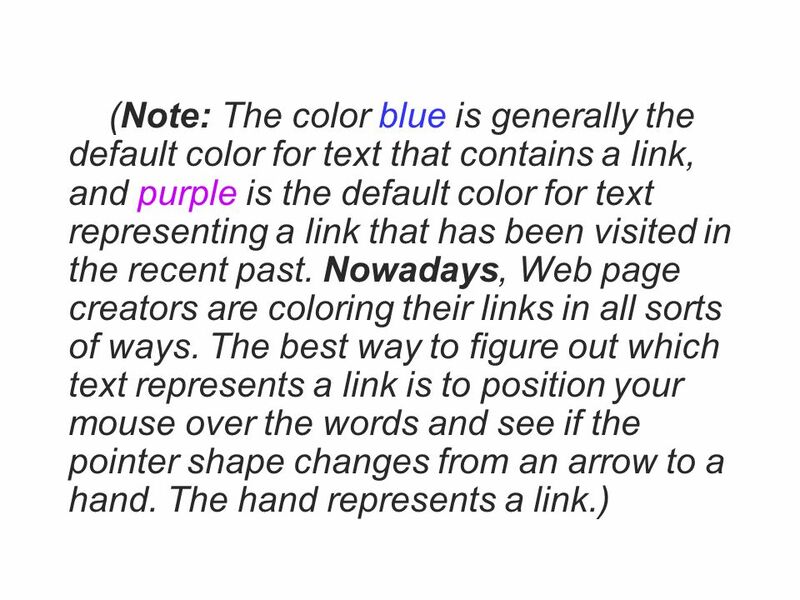 Page 1 Web Basics The World Wide Web The Web is a collection of files organized as a giant hypertext Many of these. 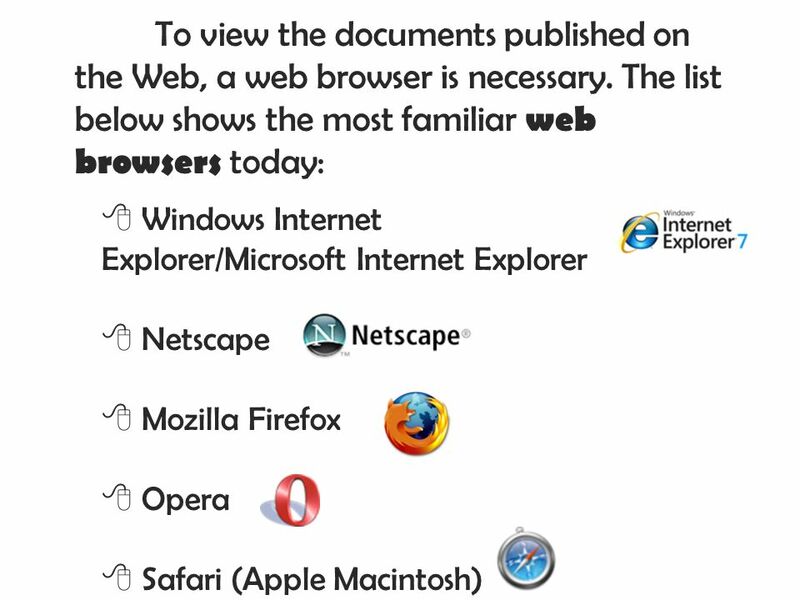 The Internet 8th Edition Tutorial 1 Browser Basics. CMP 101 INTRODUCTION TO THE INTERNET L02. Internet Unit A. Is CPCC Right For You? 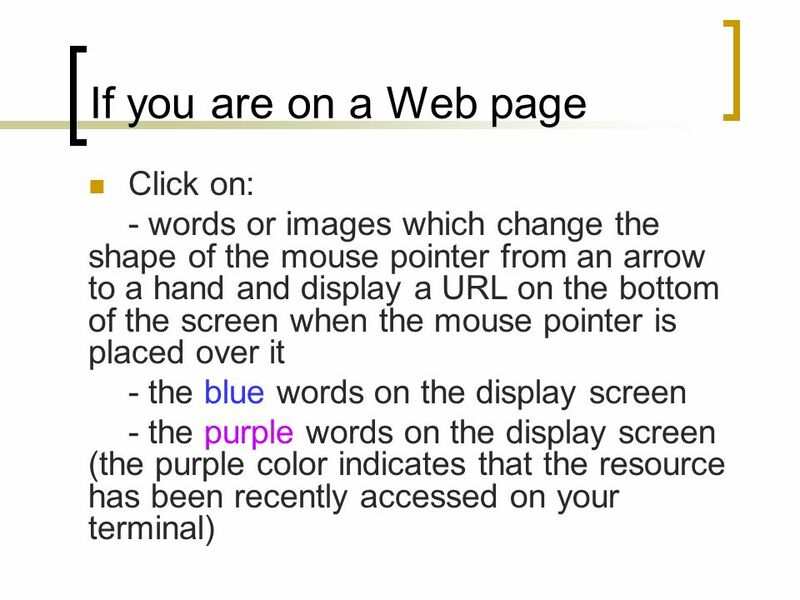 Module Two to determine your readiness for online learning Remember to click the mouse to advance the to the next slide. FIRST COURSE Computer Concepts Internet and Microsoft Office Get to Know Your Computer. 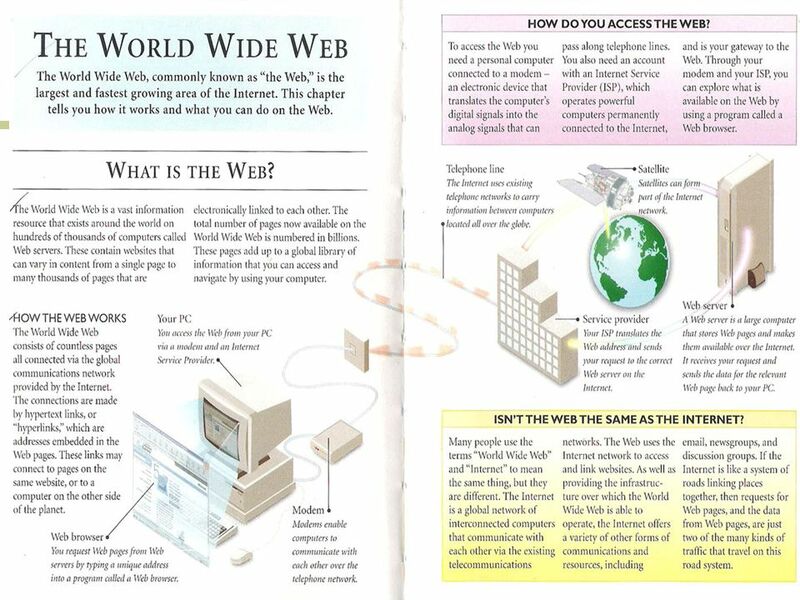 What Is A Web Page? 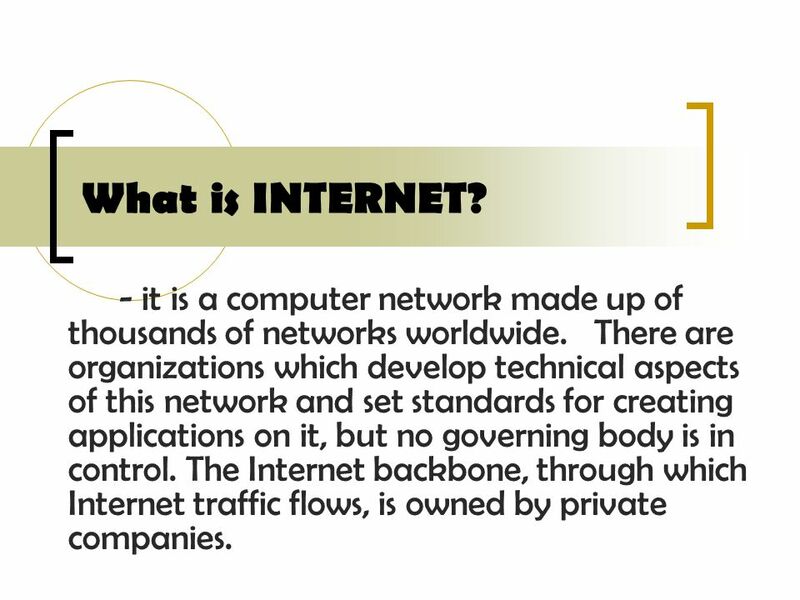 An Introduction to the Internet. Introduction to WebCT Sheridan College Architectural Technology.